Ion-line water driven foam proportioning pumps have become more and more popular in the last decade. Their low pressure drop and accurate foam proportioning over a wide range of flows are necessary in many systems. But this technology is not simple: the equipment on the market until now is quite complicated and sensitive to contamination and over speeding. The new Turbinator water driven foam proportioning pump developed by Knowsley SK effectively solves these problems, making this technology the preferred choice for a wide range of fire fighting systems. The Turbinator is a positive displacement foam proportioning pump designed for Fixed and Mobile applications. The unit is driven by a special volumetric water motor which is directly coupled to a precision gear foam pump. Because both parts of the Turbinator are positive displacement devices, the ratio of foam concentrate to firewater is fixed over the full operating range. This makes Turbinator the ideal proportioning technology for systems with different flows, such as multi-legged deluge systems, sprinkler systems and mobile large incident equipment. The Turbinator unit does not require setting up or on-site adjustment – the proportioning rate is achieved at any flow rate and pressure within the operating range. 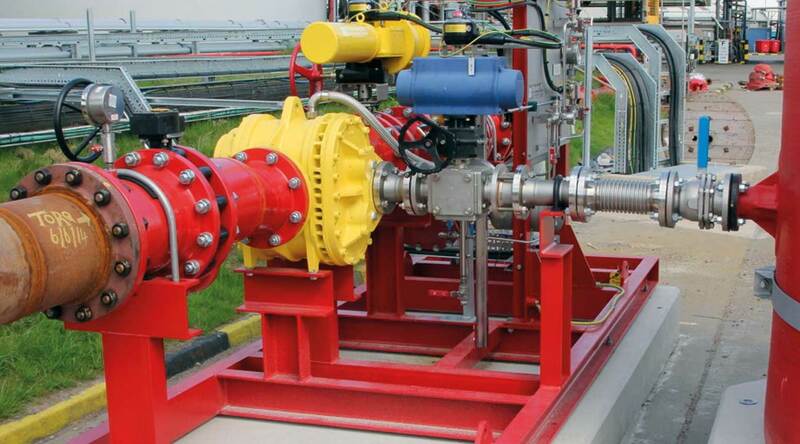 MAXI Turbinator installed on fixed skid feeding foam pouring systems on storage tanks and bunds. With Turbinator technology, Knowsley introduced a flexible, abrasion resistant paddle material in the water motor which gives the unit its unique wear characteristics. The usual contamination present in fire water does not damage the paddles. Overspeed up to 120% of the nominal flow, which can occur during automatically controlled activation of large systems, does not damage the unit. In addition, the Turbinator resists dry running in accordance with NFPA20. The close-coupled design offers a very compact and efficient installation with just three connections: fire water inlet (1), foam concentrate inlet (2) and foam solution outlet (3). The unit can be installed directly into vertical or horizontal piping systems. The Turbinator foam pump delivers 3m suction height easily, which makes it possible to install the foam concentrate tank below the unit installation level – even with high viscosity concentrates in arctic conditions (thick foams). Simple, cost effective atmospheric foam tanks are fine for Turbinator. With its unique low differential pressure, Turbinator fits in the most complicated systems, even when long pipe runs or static pressure loss are involved. Turbinator does not require external power supply or control circuits and is safe for any ATEX environment. The Turbinator is available in 3 sizes from 500 l/min to 12’000 l/min with proportioning of 1% and 3% with freshwater and saltwater construction. Each Turbinator built in our Manchester, UK factory is 100% functionally tested on a high flow test rig through its whole operating range ensuring functionality at all times.